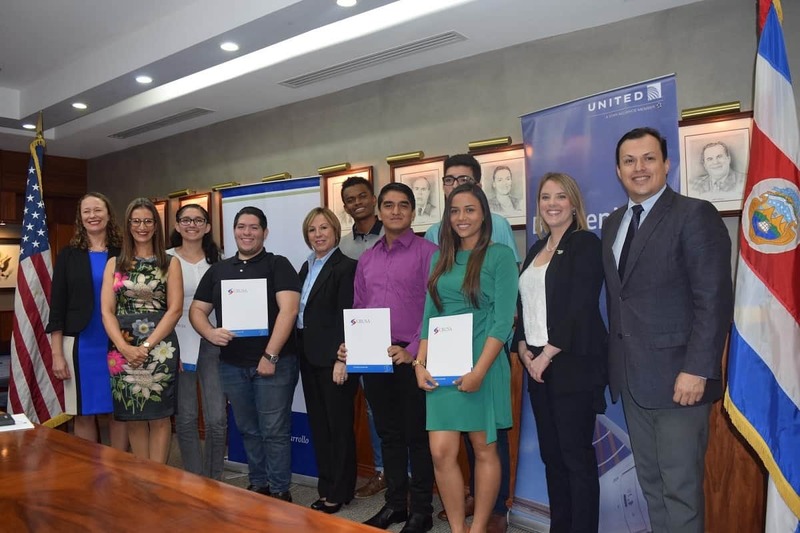 Their outstanding academic performance, English fluency, leadership, and interest in science, technology, engineering and math (STEM) have paid off: six Costa Rican students have won a scholarship for technical studies in the United States. María Nazareth Mata Castillo, Valeria Saborío Barquero, Diego Hernández Montero, Maxwell Jornae Pita Nelson, Josué Ortega Ramírez and Antony Ramírez Montero became the second class of recipients of the Dr. Ana Sittenfeld Specialized Technical Grants this week. The program is made possible by an alliance between the Costa Rica USA Foundation for Cooperation (CRUSA), the Costa Rican Investment Board (CINDE), the U.S. Embassy, United Airlines and the Costa Rican-North American Cultural Center (CCCN) through its educational advisory office, Education USA. According to CINDE, multinational businesses are poised to double their number of jobs year-on-year if the supply of qualified personnel increases in STEM fields. In 2017, 13,754 high-quality and well-paid jobs were generated, CINDE states. Of the young people who received scholarships, five are from public Vocational High Schools (CTP) in General Viejo, Santa Ana, San Isidro de Heredia, San Agustín and Cartago (COVAO), while the sixth is a student from the José Ramírez High School, a public school that offers the International Baccalaureate program. All six participated in a rigorous selection process with a committee made up of representatives from CINDE, the Embassy, Education USA and the CRUSA Foundation. Maxwell Jornae Pita Nelson, 18, from the CTP San Agustín, says that while it was difficult to leave his mother and sister behind in Limón, on the Caribbean coast, to live and study in Cartago, he knew it was essential to get a good education that has now led to international study. María Nazareth Mata Castillo will have to leave her home in Peñas Blancas de Pérez Zeledón, where she lives with her parents and four siblings, to follow her dreams and her passion for math.